Thanks to everyone who came along to our members social night last night on Friday night in the Black Boot Ferbane. Thanks to the Black Boot for the finger food and providing us with the space for the event. Next meeting is on in early March. Contact Sarah Kelly for details on 086-3575915. 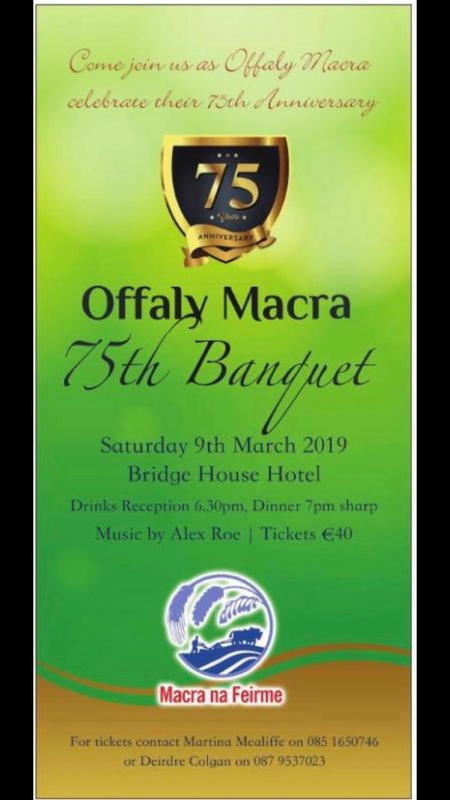 Offaly Macra 75th years of Macra na Feirme Dinner Dance is on March 9, 2019. All welcome with both past and present members welcome. Tickets are still available from the club committee. Contact Sarah Kelly for details on 086-3575915. Soccer continues on Thursday evening in Leah Victoria Park on the ASTRO pitch from 9-10pm, everyone is welcome. Collect your Tullamore Macra Half Zip on Wednesday, February 27 at around 8pm in Macari’s. We’re hoping to get as many members there as possible for a photo, a bite to eat and a catch-up. Can't wait to see you all there! Half zips will only be available for collection at monthly meetings after the launch night. Tullamore Macra are delighted to congratulate Boyce Claxton and Louise Tyrrell who will not only be representing their club, but county Offaly as well at the Mr Personality and Queen of the Land competitions this year. Congratulations lads! We're all so proud of you already. Are you a past member of Offaly Macra? Offaly Macra is celebrating its 75 years anniversary this year and preparations are underway for our celebratory dinner dance which takes place on March 9 in the Bridge House Hotel, Tullamore. Music on the night will be provided by local country singer Alex Roe. Tickets to the event are €40 and are on sale at the moment. Since the first meeting was held back in 1944, Offaly Macra members have been provided with many opportunities ranging from travel, educational and personal developments. Throughout this time, many national titles have returned to the faithful county for competitions ranging from Stockjudging, Drama, Culinary Arts, Tag Rugby, Queen of the Land, Mr Personality, Know Your Ag, Farm Skills and Ploughing. Offaly Macra was once home to 22 Macra Clubs - Ballycommon, Banagher, Birr, Boher, Clareen, Cloghan, Croghan, Daingean, Drumcullen, Durrow, Edenderry, Ferbane, Geashill, Killeigh, Killoughey, Kinnitty, Lusmagh, Mountbolus, Rahan, Rhode, Shinrone and Tullamore. Today, there are currently approximately 160 members in Offaly Macra from clubs in Ferbane/Banagher, Kilcormac/Killoughey, Rahan and Tullamore which are active in all areas of Macra. Offaly Macra also proudly host the annual Queen of the Land which is now in its 55th year. The upcoming event on March 9 was the brainchild of the current Offaly Development Officers Steven Kelly and Emma Leogue following the county AGM last summer. They believed that an opportunity to bring everyone together again could not be missed. The remainder of the of the 75th-anniversary subcommittee is made up of Martina Mealiffe (County Chair), Deirdre Colgan (County Secretary), Laura Keena (County PRO representative) and Paul Molloy (County treasurer). If you are a past member, we would love to hear from your Macra stories, see your photos and silverware. Please email laurakeena11@hotmail.com with any memories you would like included in our slideshow on the night. For more information or to book tickets, please phone or text Martina on 085 1650746 or Deirdre on 087 9537023 or alternatively private message the Offaly Macra Facebook page.